Selinium wallichianum rises later in the spring than most perennials. But, once it is ready to re-grow, it spreads out its basal leaves to form mats of fine foliage. Each leaf is intricately divided. Strong ribbed stems then start to push up, heavily endowed with more fretted leaves, making tiered layers of lace. The stems branch but the tiered effect is maintained. During late summer, the flower buds emerge, inverted and cradled by the supporting pinky-bronze stems. Each flower head becomes a plateau composed of a number of smaller florets, which in turn are made up of a myriad of tiny flowers. The flower heads are perfect circles composed of smaller circles. It works well as an isolated specimen or can take its place among other border plants as a team player - although one cannot help thinking it should always be made a General. Indeed, that most famous of gardeners, E A Bowles called it ". . . the queen of all umbellifers, with its almost transparent tender green-ness and the marvellously lacy pattern of its large leaves . . . the most beautiful of all fern-leaved plants". 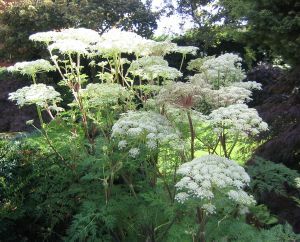 Selinum wallichianum has a reputation for reliability and longevity. South, east or west facing aspect, exposed or sheltered. Grow in moderately fertile, moist but well-drained soil in full sun or partial shade. Soil can be acid, alkaline or neutral, sand, loam, chalk or clay. Pruning \ Aftercare : Remove faded flowers, clear away dead foliage in winter.